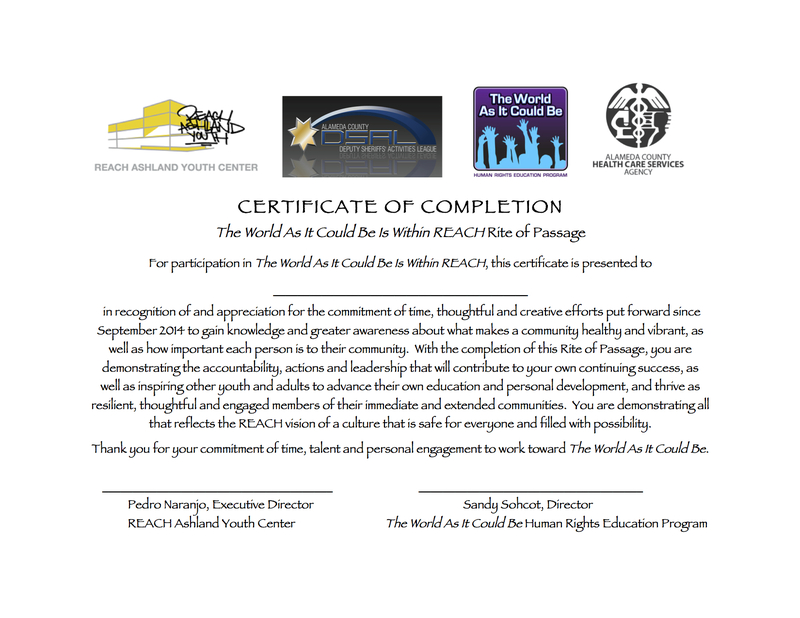 In September 2014 we launched The World As It Could Be Is Within REACH Rite of Passage program. Over a nine-month period from September 2014 to May 2015, 11 participating youth learned about what makes a community healthy and vibrant, what contributes to their resiliency and success, and how an understanding of the Universal Declaration of Human Rights is connected to these qualities. With this information came the encouragement for each participant to recognize and take hold of their inner strengths and gifts as they pursue their goals. Each month, participants learned about the program areas of REACH: Recreation, Education, the Arts, Career/Financial Literacy, and Health. They also received guidance from Mika Lemoine, a teaching artist from Destiny Arts Center, as well as from Ellen Sebastian Chang, Creative Director of The World As It Could Be Program, and Amber McZeal, to use creative arts exercises and activities to forge personal bonds, reflect on the information presented, and express ideas about how the information could spur positive action and change. On May 15, 2015, the youth articulated their reflections at their public culminating presentation so that the audience of family members, REACH leaders, political and community leaders could celebrate their accomplishments and aspirations. This video highlights different elements of the program through the nine months, as well as personal reflections of some participants. Frederick Marx and his team at Warrior Films, including Spencer Wilkinson, created the video. Frederick’s involvement has been especially meaningful given his documentary film work on the importance of Rites of Passage for youth. It was Frederick’s presentation at our March 4, 2013 program at Balboa High School that helped inspire the creation of The World As It Could Be Is Within REACH. This program for the May 15th Culminating Presentation shows the people and organizations whose involvement and support made The World As It Could Be Is Within REACH possible. Based on the positive impacts and success of the first year, we have now begun the 2015-16 class of the Rite of Passage Program. We endeavor to have this Program be a model that can be replicated in other communities. Please contact us at info@theworldasitcouldbe.org to explore the possibilities for your organization or community forum.